ACM SIGGRAPH has standing committees which provide valuable input into various segments of the organization: Awards, Chapters, Communications, Digital Arts, Diversity and Inclusion, Education, External Relations, Information Services, Nominations, Publications, Specialized Conferences and Student Services. Committee chair terms are three years, beginning on 1 September. Nominations for open chair positions will accepted by the Nominations Chair until May 1 of the year the term in question ends. Chairs are eligible to run for succeeding terms. There are no term limits for committee chair positions. If a committee chair is unable to complete the three-year term, a replacement will be appointed by a majority vote of the EC to fill out the remaining term. If you would like to devote some of your time and energy to one of these committees, please review the committee responsibilities and fill out the organization volunteer form. Good volunteers are always welcome. Chapters of ACM SIGGRAPH continue the work of ACM SIGGRAPH on a year-round basis via their meetings, site visits, conferences, video screenings, art shows and special events. Each ACM SIGGRAPH Professional or Student Chapter consists of individuals involved in education, research and development, the arts, industry, and entertainment. ACM SIGGRAPH chapter members are interested in the advancement of computer graphics and interactive techniques, its related technologies and applications. The Professional and Student Chapters maintain web sites to provide more information about their activities, links to helpful resources, and connections with other members of the computer graphics and Interactive techniques community. The Communications & Membership Services Committee oversees content development for the ACM SIGGRAPH web site, membership communications, and benefits procurement. The Communications Chair is also in charge of the ACM SIGGRAPH Village at both annual conferences. 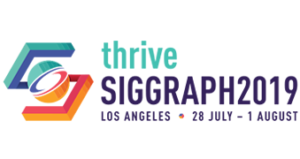 The Diversity Committee celebrates the diversity that exists within the SIGGRAPH community and provides opportunities both in-person and year-round to connect with others with common backgrounds, ethnicities, and gender for mentoring and inspiration. The goal of this committee is to create a welcoming and nurturing community for everyone working in computer graphics and interactive techniques independent of gender, ethnic background, and abilities. The Digital Arts Committee fosters the evolution of a strong digital arts community within the international organization and promotes a dialogue between visual artists and the larger SIGGRAPH community. It maintains an interactive Arts Portal and an associated social networking site that provides a central place for artists and scientists to share resources, information, artwork, and opportunities for collaboration. The Education Committee works to support computer graphics education and the use of computer graphics in education. Computer graphics education encompasses technical, creative, and developmental studies in curricular areas ranging from computer science to digital arts. The Education Committee undertakes a broad range of projects and activities in support of the CG education community, such as curriculum studies, resources for educators, and SIGGRAPH conference-related activities, including the international, juried SpaceTime Student Competition & Exhibition. The External Relations Committee establishes and oversees ACM SIGGRAPH’s agreements with numerous organizations and conferences around the world. The chair of the External Relations Committee is the past president of ACM SIGGRAPH. The Information Services Committee (ISC) manages the ACM SIGGRAPH internet infrastructure and works closely with the Communications & Membership Committee to manage content development. To request or modify a listserv on www.siggraph.org, please use this form. The Nominations Committee oversees ACM SIGGRAPH committee chair nominations. The chair of the Nominations Committee is the past president of ACM SIGGRAPH. ACM SIGGRAPH publications provide the world’s leading forums for computer graphics research. Our conference series provides the largest source of citations in computer graphics literature. Publications are available to ACM SIGGRAPH members for substantial discounts. ACM SIGGRAPH helps organize and sponsor focused conferences, workshops, and other symposia around the world on topics related to computer graphics and interactive techniques. These gatherings enable groups with specific interests to get together and exchange information. The Student Services Committee provides continuity and institutional memory for the student volunteer and intern programs at SIGGRAPH and SIGGRAPH Asia, provides and/or demonstrates the value of SIGGRAPH membership to student members, and coordinates and collaborates with other SIGGRAPH entities (conferences, committees, etc.) on issues that affect student members. Additional committees and subcommittees that have very specific responsibilities and are led by EC-appointed chairs. The Awards Committee oversees four annual awards and one biennial award in recognition of exceptional achievements in computer graphics and interactive techniques. The Conference Advisory Group (CAG) assists in the strategic planning of the annual SIGGRAPH conference. Digital Media Assets is a subcommittee of Communications that facilitates the use and dissemination of ACM SIGGRAPH’s digital assets. The ACM SIGGRAPH International Resources Committee (IRC) is a subcommittee of Communications that hosts the International Center at the SIGGRAPH conference and drives year-round strategies to promote ACM SIGGRAPH and connect its global community. The Papers Advisory Group (PAG) serves as a forum for discussion of issues that affect the papers community and support system to provide institutional memory for the papers chair and program. The SIGGRAPH Asia Conference Advisory Group (SACAG) assists in the strategic planning of the annual SIGGRAPH Asia conference.